See this page and find out how to activate program. Start AINesting and you'll see "About window"
If your PC has Internet connection, then you'll see this message. If program did not activates itself, then use manual mode as shown below. Close this window and go to activation page. 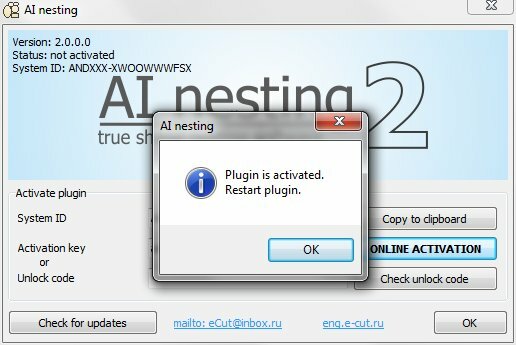 Select "AI nesting"
And here you have your unlock code, copy it to clipboard. Open AINesting. Paste unlock code and press "Check unlock code" button. If you did everything as shown, you'll get this message. PS: and remember, if there will be any problems with activating program - contact to your reseller, he'll help you to solve all problems!